The story of good beer is a familiar one: A craft brewery run by a bearded creative with an independent streak puts out unique brews. The passion to start the brewery came from being unsatisfied with the major American market of macro lagers, which led to home brewing, then to a local brewery, and then to a larger brewery with real distribution and influence. The beer does well because it’s bold, hoppy and different from the blue and white 30-racks lining grocery store shelves and beer fridges. But as picturesque as that sounds, the route to good beer starts much, much earlier. Your favorite craft beer starts with hop farmers and their fields — more likely than not in Yakima, Washington. The farmers and their companies aren’t getting credit for the decade and a half of explosive craft beer growth, even though the industry grew on the hopped-up flavors of big IPAs. The farmers aren’t complaining, though. Many families have been in the business for generations, and they’re satisfied knowing that good beer starts with good ingredients. It’s impossible to truly understand the rise of craft beer without understanding the importance of the relationship between brewer and hop farmer. For every superstar brewery sticking it to the man, there’s a farmer working the land. Forget the latter part of that equation, and you forget that beer doesn’t simply come from cans and taps, it comes from a collaboration between farmer and brewer. Jeremy Kosmicki, Dave Powell and Dave Engbers — Founders’ brewmaster, brewer, and cofounder — broke into a brewer’s block of hops at CLS Farms. 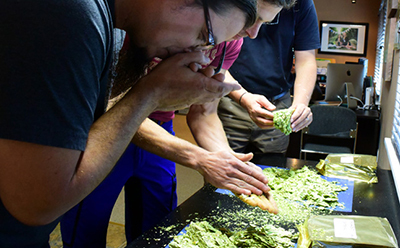 Each man grabbed a handful of dry hop cones, rubbed their hands together to warm the hops and release the aromas, and then inhaled. Eric Desmarais, the owner of CLS Farms, told them that the first block they smelled paired perfectly when mixed with the second block set out. Kosmicki laughed, made a joke about people not being able to make a decision on what they like, and then brushed the sticky green hop residue off his hands as best he could. The three men broke into the second one and smelled it. Then they mixed the two and smelled them both together. Kosmicki and the Founders crew — which on that trip also included Founders vice president of wholesale development Michael Bell and social media specialist Steve Cummings — know how important it is to land the right combination of hops. The whole craft IPA movement is based on hop flavors from the unique to the reliable, and finding the right mix isn’t easy. There are more than 170 different varieties of hops in the world, and no one knows them better than the farmers who grow them. Just as the brewer’s home is in the brewery, the hop farmer’s home is in between the rows of 18-foot hop bines and processing plants. Farm owners are looking for what brewers (and consumers) want: citrus, pine, tropical fruit, pineapple. Each variety offers something just a touch different, whether it’s Emerald’s strong grapefruit, Citra’s lemons, or Mosaic’s peach, blueberry and tropical fruit notes. Hell, there are even hops that give off an “OG” aroma, or “onion and garlic.” And when you’re the size of Founders — which has a production capacity of nearly one million barrels of beer a year — you need hops to consistently deliver on flavor, aroma and volume. CLS, like many hop farms in Yakima, processes, dries and bales the hops it grows. The processing plant sits in the middle of the fields. It’s humid inside the drying room and smells like the foam off a fresh IPA. A constant hum of hops cascading off a beltway and onto the drying room floor plays in the background. For the past six years, Kosmicki, Engbers, and other members of the Founders staff have made the 2,000-mile trip from Grand Rapids, Michigan, to Yakima. They aren’t alone. During the same week as Founders, brewers from Dogfish Head, Sierra Nevada and other breweries that make up the who’s who list of the craft-brewing world were making the rounds. Cummings noticed that as he left one farm, brewers from Coors were going in. Hopsteiner Farms, another place I visited with the Founders crew, had between 500 and 600 people visit during the harvest of 2016, Bill Elkins, Hopsteiner’s West Coast sales representative, told me. Elkins has been working with hops since 1987. He’s always seen a relationship between the brewer and the grower, but it has never been as direct as it has over the past decade. “The craft industry and the sheer number of brewers, they’re less corporate than some of the traditional customers for hops worldwide, and they seem to be more interested in connecting on a one-to-one basis with the producer,” Elkins said. In Yakima, where some 77 percent of the total hops in the United States are produced, the history leading up to this point goes way back. The Yakima Valley website Spirits and Hops Trail dates the first hop farm to 1872 and a man named Charles Carpenter. In 1876, Yakima produced 80 bales of hops. By 1890, Yakima County was crucial to hop production in Washington, nine years before it became a state. Hop farming, like every alcohol-related product in the United States, faced dire times from the 1920s to the 1940s. Prohibition did a number on hop farms, as they had to rely solely on exports. Fortunately, the world market recognized Yakima hops and the industry survived. 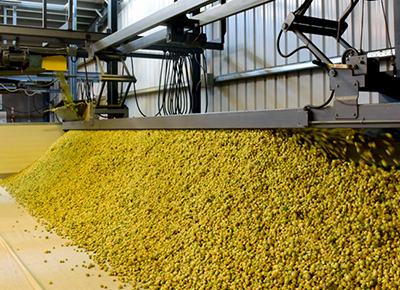 Yakima is still recognized today, and two-thirds of the hops grown there are shipped out to the international market. “If you’re not picking out the best hops, you’re getting what’s left from what people haven’t picked.” — Jeremy Kosmicki, Founders Brewmaster. The American craft brewers who visit, however, have changed the scene dramatically. The discussion happened some eight years ago, before company-sponsored trips to Yakima became a tradition. As I walked through Hopsteiner’s experimental field, where farmers spend around a decade cultivating a single new strain, I spoke with a farmer whose family had been in the hop business for three generations. He worked the hop fields growing up just like his father did, harvesting by hand and getting paid by the bine. A lot has changed since then — technology-wise as well as the general attitude toward hoppy beer. With that attitude change came a change in the importance of hops in the final product. The beer world has changed dramatically in the past 20 years. Craft beer is booming, there are more breweries in the United States than ever before (although not the most per capita, so there’s still room for growth). The big beer companies are bigger than ever. Beer, once defined by middle America and blue collar workers, is now a gastronomic centerpiece. It’s still a more casual everyday drink than something like wine, but beer-drinking culture has picked up steam with tasting menus and special releases. With that established market of flavor-seeking consumers, the brewers need increasingly distinctive beers. The consumer will probably never know all about the hop farms and the brewer-farmer relationship. Frankly, they don’t really need to. But it is clear that without that relationship, the craft market would start to dry up. At the Hopsteiner dinner on my last night in Yakima, the beer was flowing. I sat across from Stephen Rich from the soon-to-be-open Cowbell Brewing in Canada. He later wrote a blog post about his trip and the process of hop selection, where he epitomized the importance that relationships play even in the very early years of a brewery. Yes, the business side of craft brewing has practically made that friendship a necessity rather than a luxury. But there’s a good argument that brewing should have always been this way — collaboration on all fronts builds a better end product. 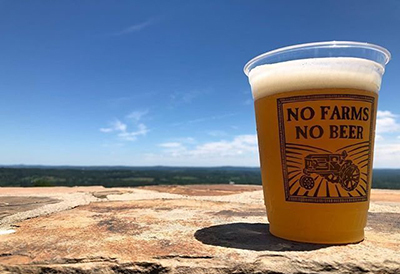 Which is part of the reason farms like CLS, Roy Farms and Hopsteiner spend hours catching up with brewers from around the country during the busiest five weeks of the hop growing season. Brewers descend on Yakima all at once. The quiet streets of Yakima fill up with the people who make some of America’s favorite craft beers. The hotels sell out and the bars fill up. Now there’s no going back, and beer drinkers everywhere should appreciate that.